If you want to know what investors think, watch what they do with their money. Sure, folks might say they're bullish or bearish if you ask them... But you won't know for sure until you see the money move. It's the best way get a real sense of what folks think about an investment idea. And right now, investors are scared of investing in one part of the world. We know because of what recently happened with real money. Investors fled... And that's set up a big opportunity. History says we could see another 20%-plus gain over the next year. And we have a simple way to take advantage of it. Investor fear has jumped borders. The February correction was a shock to investors around the globe. And that fear crept into the U.K. stock market in recent months. Investors rushed out of U.K. stocks in March. On March 7, shares outstanding of the largest U.K. exchange-traded fund ("ETF") – the iShares MSCI United Kingdom Fund (EWU) – fell 13.9%. Remember, funds like EWU create and liquidate shares based on demand. 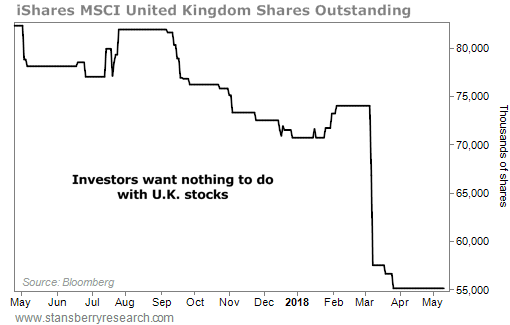 So a falling share count means investors are selling U.K. stocks. In this case, they've fled. This is what I want to see as a contrarian. And it has set up a rare but powerful opportunity. These are BIG numbers. Especially in a market like the U.K., which hasn't moved much over the past two decades. Shares of EWU went on to jump 12% six months after similar occurrences... and an incredible 29% over the course of the year. Those are stellar returns. And consistent, too. We've only seen four other instances of falls like this since 1996... And all four cases led to 20%-plus returns a year later. Of course, four opportunities in 20-plus years means our sample size is small. But the data behind those few examples is impressive. This is already playing out today. EWU had its shares outstanding crash in early March. The fund is up more than 5% since then... And it has kicked into a nice uptrend. But the upside is still significant. History points to 29% upside a year after similar peaks in investor fear. That means EWU has a good chance of rallying 20%-plus from here. Investors have told us – with their money – what they think of investing in the U.K. It has set up a major opportunity. And EWU is the simple way to take advantage of it. Steve recently wrote about the investing opportunity in another part of the world. This contrarian bet has huge upside potential over the next couple of years... Read more here. "Fund managers are worried about a market top," Steve writes. This fear could be a good sign for U.S. stocks. With the big money still on the sidelines, share prices have plenty of room to soar... Learn more here. As a trader or investor, you should have opinions – even strong ones – that are supported by evidence. But once you exchange your cash for shares, your opinions don't matter. If you're nervous about the stock market right now – or if you're wondering where to put your money to work – I want to share something with you. He understands what asset prices do over the long run as well as anyone on earth. So what does Dimson think about stock prices today? If you own some stocks, an emerging markets fund, and some bonds, you might think your portfolio is well diversified. But it's probably not. © 2018 Stansberry Research, LLC.